Any masochist who wants to feel depressed about the state of the New Zealand judiciary needs only to turn to Justice Terence Arnold’s recent majority decision in the Court of Appeal – and read through his rationale for dismissing the Valerie Morse appeal against her conviction for burning a New Zealand flag at the Dawn Service in Wellington on Anzac Day, 2007. In a judgment delivered late last month, Arnold and his colleague Justice William Young agreed with the lower courts that Morse had indeed been guilty of ‘offensive’ behaviour. On the other hand, anyone who wants to feel upbeat and /or exhilarated about the standard of the New Zealand judiciary should turn to the dissenting opinion in the same case written by Justice Susan Glazebrook – which hands to the Supreme Court on a platter any number of compelling reasons for overturning this judgement, if the case ever manages to get there on appeal. The 44 page pdf decision on Queen vs Valerie Morse can be accessed here. Hold on though – haven’t we been here before ? Yes, we have. A few years ago, when he was the Solicitor-General, it was Terence Arnold who led (and lost) a series of Crown Law cases involving Ahmed Zaoui – and he was promoted to the bench by Attorney-General Michael Cullen soon afterwards. Similarly, it was the same Susan Glazebrook who wrote the 2004 Court of Appeal judgment on the Zaoui case, which laid the intellectual foundation for the Supreme Court verdict the following year – mainly, by establishing the level of risk posed by Zaoui that the SIS would need to establish, in order to justify his deportation under the Refugee Convention. Ultimately, the SIS didn’t even come close. With the Morse case, the competing rights at stake go to the heart of free speech under our Bill of Rights Act [BORA], and the boundaries – if any – for political protest in a democracy. On paper, it may have looked like a quite even contest of competing rights. On one side, were the people attending the Dawn Service on Anzac Day, a ceremony where New Zealanders who have suffered and died in wartime service to this country are honoured by their former comrades, families and the community at large. Simultaneously, other citizens wish to use this public occasion to protest against further sacrifices, in current and future wars. 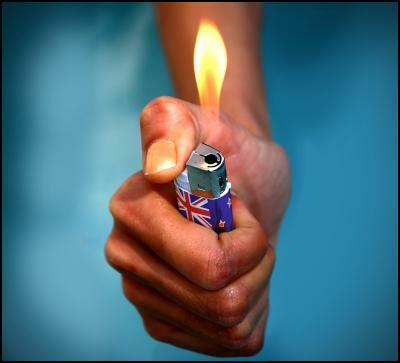 In the lower courts, evidence had been presented that the dual actions of blowing horns and burning a New Zealand flag had disrupted a speech being given by a former Defence Ministry senior official, Graham Fortune, and prevented him from being heard. The brief attempt by Morse (quickly curtailed by Police) at flag burning was the ‘offensive’ behaviour at issue. The horn blower was not prosecuted, and neither was Morse’s accomplice in her flag burning attempt. Free speech of course, is not merely the right to speech (and action ) by people seeking to make a point. The law – and the David Irving incident a few years ago – have underlined that free speech also includes the right to listen and hear, especially on issues of public interest. At the Dawn Service in 2007, the free speech rights of the protesters and the free speech rights of the audience to hear what Mr Fortune was saying were in conflict – which is perhaps inevitably the case, at any protest at or near a public event. The content, style and duration of the protest then all come into play. Even the act of flag burning is not as clearcut as it might seem. Yes, our Flags, Emblems and Names Protection Act (1981) does make it illegal to destroy the New Zealand flag with the intent of dishonouring it – and a few years ago, a school teacher was convicted under this law for burning a New Zealand flag at an Iraq war protest. However, a higher court later quashed the conviction, mainly on BORA freedom of expression grounds. It was held that the word ‘dishonour’ carries shades of meaning, and that the schoolteacher’s action fell towards the lower end of the spectrum. Which raises further questions – if you burn the flag for a sincerely held political belief, are you exhibiting the legally required intent of dishonouring it, or are you honouring its ‘true’ meaning ? In practice, couldn’t it even be argued that the right to burn the flag is the very essence of the freedoms that the flag represents? One can sympathise with Justice Arnold’s task of picking his way through these minefields, while still lamenting the way he has gone about it. the appellant’s burning of the New Zealand flag was offensive behaviour within the meaning of section 4(1)(a) of the Summary Offences Act 1981 [ which imposes a fine not exceeding $1,000 on anyone who behaves in an offensive or disordely manner in or within view of a public place’] In determining that question, the Court must consider whether her conduct was expressive behaviour protected by s 14, and if so, whether the restriction of that right was a reasonable limit demonstrably justified in a free and democratic society. So how did Justices Arnold and Young reach the conclusion that it was reasonable in the circumstances to limit Morse’s rights, while Glazebrook concluded that it wasn’t? The main precedent for the balancing act involved, Arnold agreed, the New Zealand case of Brooker. Briefly, Brooker had sung and played his guitar loudly outside the home of a police constable who had previously been involved in the execution, late at night, of a search warrant on his property – so Brooker chose to retaliate at a time when he knew she was home from a night shift and trying to sleep. Police were called, Brooker was arrested and convicted of ‘disorderly’ behaviour – but in a majority decision, the Supreme Court later threw out his conviction on freedom of speech grounds, given the importance of protest in a functioning democracy. Arnold then steps back to summarise the situation thus far, and it is at this point that the logic involved begins to unravel. “Offensive behaviour,” Arnold writes at para 21(a) depends on “the likely impact on persons potentially exposed to it… Unlike disorderly conduct, there is no requirement of a tendency to disturb or violate public order.” However in the next breath, Arnold then says that “the subjective reactions of those actually exposed to the conduct are not determinative.” In other words, while the offensiveness depends on the impact upon those affected, what they feel about it doesn’t decide the issue! I consider that the objective element which Blanchard J identified in relation to offensive behaviour – namely, that it must offend a reasonable person of the type actually subjected to it – provides the appropriate limiting mechanism. Plainly, the subjective reactions of those who are subjected to the impugned conduct could not be the appropriate measure of what is offensive under s 4(1)(a). That would place too much power in the hands of the audience and constitute too great a restraint on the expression of unpopular opinions. Yes, the matter cannot be left to the rabble, and their subjective emotions. The matter must be decided ‘objectively’ via some form of judicial divination of how a hypothetical right-thinking set of citizens would feel and react – and who by definition will think just like the non-protesters at the Dawn Service, and presumably, just like some judges on the bench. Anzac Day is an important day of commemoration for New Zealanders. It does not simply commemorate the more than 2,700 New Zealanders who died at Gallipoli. Rather, it has become an occasion on which the sacrifices of those New Zealanders who died or suffered injury in all wars are remembered and acknowledged. Anzac Day has become part of our national psyche. The Dawn Service at the Cenotaph is a solemn and increasingly well-attended occasion. Indeed, that is why, according to the appellant, she and her colleagues decided to protest at it. It gave their protest maximum impact. At such a commemoration, the national flag assumes a special symbolic importance, representing our national identity. Again, as her counsel acknowledged, the appellant recognised this. As they put it, the appellant wished to utilise “the unique potency of the flag” as a protest symbol. Burning the flag in protest on such an occasion is, in our view, well capable of being regarded as offensive, that is, “wounding feelings or arousing real anger, resentment, disgust or outrage in the mind of a reasonable person of the kind actually subjected to it”. This arises from the purpose and nature of the Dawn Service, to which I have already referred, and from the type of people who were in attendance. These included returned servicemen and servicewomen, the relatives of those who served in war, some of whom were killed, and other members of the public, including children. For such people on such an occasion, the national flag would reasonably have had special significance. Finally, to lend legal ballast to his concluding section, Arnold cites two US cases – both of dubious relevance to the events at the 2007 Dawn Service – before sprinting for the ‘appeal dismissed’ finishing line. One such citing refers to an abortion clinic case – Hill vs Colorado – where a US Supreme Court majority held that women attending an abortion clinic had a right not to be lobbied and counselled by protesters without their consent, within an eight feet radius as they entered the clinic. Yet, as even the Wikipedia entry on this case shows the Hill judgement was about access rights to a medical facility, and not freedom of speech. Communication without consent was still possible beyond the zone mentioned and (with consent) within it. Contrary to what Arnold maintains, the case can thus bear little or no relevance to the free speech/captive audience issue at stake with Morse. Secondly, Arnold cites a US case [called Phelps-Roper] that involvies privacy rights at a private funeral – again this has little or no relevance to a Dawn Service that, as Glazebrook points out, is increasingly less and less an occasion for expressing private grief and loss, and more and more a public occasion at which the community and the nation ritually expresses its gratitude for those who have fought and suffered in its defence. Ms Morse was doing nothing more than the second flag burner who was not prosecuted; and Ms Morse’s activities were less disruptive of proceedings than a horn blower, who was not prosecuted for blowing a horn. Starting from the bottom and working up, Glazebrook dismisses the last paragraph on the grounds of valid Police discretion, but gives weight to almost all of the rest. It struck her as significant to its intent that the protest did not involve lewd or morally offensive behaviour. The protest action also focussed on the speech by the Defence bureaucrat, and did not occur during the wreathlaying or commemorative parts of the ceremony more directly expressive of personal grief. The protest was also condcuted at a distance, was brief in duration, and took place on university grounds (where freedom of expression is particularly prized) and not at or by the Cenotaph itself or by the speakers’ podium, and so on. In passing, Glazebrook also lays waste the US cases relied on by Arnold for his ‘captive audience’ argument. Moreover, I consider Arnold J’s reliance on the captive audience jurisprudence to be misplaced. As recognised by the United States Supreme Court in Erznoznik, absent the situation where the degree of captivity makes it impractical for the unwilling viewer to avoid exposure, the burden falls upon the viewer to “avoid further bombardment of [his] sensibilities simply by averting [his] eyes’… As it has been recognised that the recognisable privacy interest in avoiding unwanted communication varies widely in different settings and that persons on public streets have limited privacy interests, to apply the privacy interest in avoiding unwanted communication at a public event, such an Anzac Day Dawn Service, would appear to be a significant extension of the captive audience jurisprudence. This is especially the case as it was not seen as conclusive by the majority in Brooker in a situation where it might have been thought the policewoman was particularly captive. [Anzac Day] has become…. a symbol of national identity… It is thus a conceptually different occasion to the setting of a funeral in Phelps-Roper, relied upon by Arnold J at para 35. In Phelps-Roper, emphasis was placed on the privacy rights of family and friends when mourning their loved ones. Following the jurisprudence on captive audiences, the Court reasoned that a funeral or burial service is a moment of collective, shared grief when many family and friends come to pay their final respects to the deceased and to offer comfort to one another….. it cannot be easily applied to the situation that occurred in this case. If Ms Morse had burnt the flag during a more personalised aspect of the ceremony (eg the laying of wreaths by those who had lost family or friends in armed conflict) and this had occurred by the Cenotaph or by the speaker’s podium, particularly if accompanied by the horn, the situation may have been different. It should be stressed that Glazebrook was not giving protesters carte blanche, or saying that the right of political protest at or near a public event should always overwhelm all other competing rights and considerations. She is saying that in this case, these actions did not suffice to justify cancelling Valerie Morse’s rights of free expression, and /thus justify convicting her of offensive behaviour. I particularly liked Glazebrook’s response to the ‘objective’ test of the theoretical reasonable person invoked by Arnold in the Morse judgement, and by other judges in Brooker. Glazebrook, citing the Rowe case, rejected the notion that this imaginary paragon must be like the person subjected to the protest, and then went further. If we must pursue such a test, she suggested drily, why shouldn’t it be one based on community values – and include tolerance of divergent views and rights, recognition of the importance of free speech and the role of political protest? In other words, there is no basis for inferring that our hypothetical citizen would – or should – agree with those who took offence. Those that did were free to avert their eyes (particularly given that Ms Morse was on university grounds some distance from the bulk of the crowd). Moreover, Ms Morse’s intention was to make a political statement of views genuinely held, at a time Ms Morse considered was relevant for making the points she wished to make (during a speech by an official representative as against during prayers or during the other aspects of the ceremony more related to individual sacrifice). Indeed, a commemoration service for servicemen and women of past wars might be seen as a particularly apt time to protest against current and future involvement in wars. The content of Ms Morse’s message was clear from the surrounding circumstances as an anti-war message, which could not in any way legitimately be seen as offensive. Amen to that. Right now, the challenge will be to find a fresh legal plank strong enough to leverage a right to appeal to the Supreme Court. (One cannot keep going back to court to try and get a better outcome on the same basic facts – that’s not how it works.) Lets hope there is an argument that can be mounted. Because if it is left to stand, this poorly argued majority decision on Morse cannot help but cast a chill over free speech and legitimate protest in this country.